How long have you been working on that?? 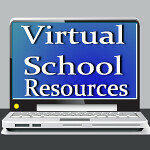 Virtual Homeschool Convention & Freebies! Special Needs? Reach Out And Touch. I took my kids to a homeschool event at a museum last night. So clever. The mom who put it together reserves the museum every year for this event. The 6-12th graders watched a movie(Journey to the Center of the Earth was the pick for this year),then had a scavenger hunt through the darkened museum. It was a blast walking through seeing flashes of light streaming off the huge dinosaur skeleton in the main room, and hearing the screams now and then as someone jumped out to scare the kids. I've always thought I was an "involved" kind of mom, you know? I always brought a snack when I was supposed to. Organized a few small events here and there. But this mom, she is the bomb! The director of the museum told me he wished she could do more for them. You should have seen the clues she provided for the scavenger hunt. She zoomed in with her camera on certain exhibits or items, and all the pictures were on one sheet. I think there were about 18...things like one flower petal, or one shell in a mound of others. They were NOT easy to identify! In addition,13 chaperones had clues for the kids, but they had to ask for the clue. Mine was leprechaun. The others were things like lucky stars, green clovers,and marbits. Now, it's true that if your kiddos weren't allowed to eat sugary cereals, they may not have known what the answer was! But surely you know, right? What? You don't know what marbits are? I didn't either! I learned they are the little marshmallows in the...Lucky Charms! Well, it was St. Patrick's Day. Pretty clever! What a fun time for the students. After the hunt was completed, we all gathered in the courtyard for snacks and to see the winners announced. I just may ask Susan, our incredible organizer, to share details of how she came up with such great ideas, and to tell us about previous events so you, too, could organize something in your area. Interested? I'd love to hear your comments!